“Inclusive, not exclusive,” that is how David Poh describes his brand new Ridgewood bar, Milo’s Yard. 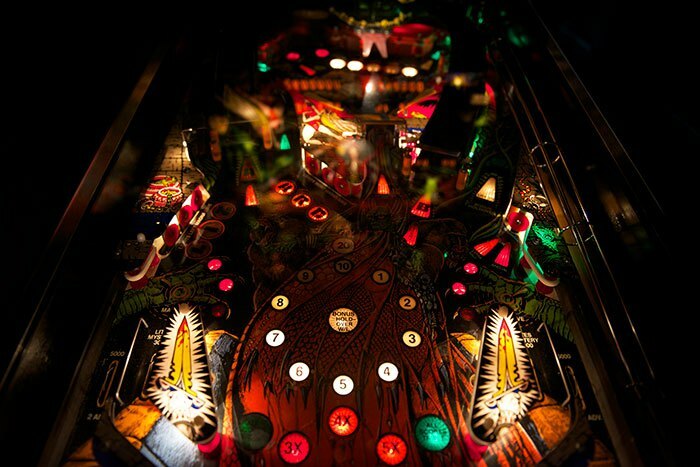 Located at 564 Seneca Avenue nestled under a cozy entrance of holiday lights, this bar has everything you’d want for the ultimate chill sesh with friends – vintage pinball, a decent craft beer selection and an ‘international street food-inspired’ menu to name a few highlights. Did we mention the bar is named after an adorable dog? 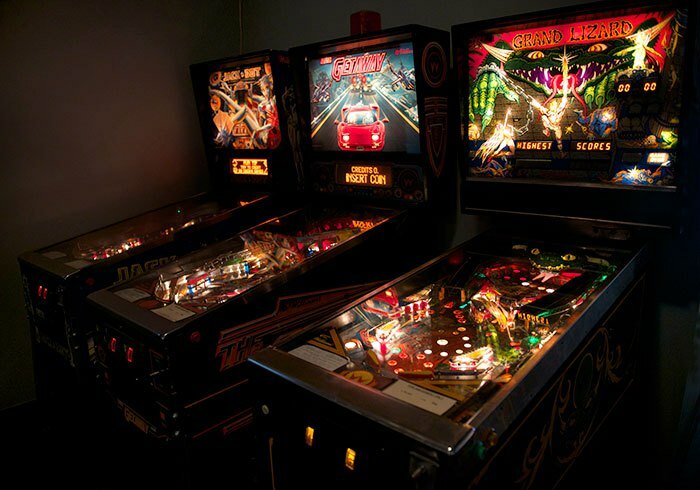 The owners are great collectors of 1980's and 1990's pinball machines. David Poh has always loved collecting 80’s and 90’s pinball machines. His wife Claudia DeMairo is a former bartender from Barcade. So it’s safe to say that by combining these two forces, this spot is ‘a must’ for gamers and enthusiasts alike. The six pinball machines present are adorned with incredible silk-screening on the back glass panels and are part of David’s personal collection. It is fifty cents to play per game and the machines will rotate over time. Hold on tight to your beers, gamers - the owners are open to hosting gaming events and pinball tournaments in the future. Happy Hour is $1 off all drinks from 4-8 p.m. weekdays – so definitely take advantage of the craft beer selection! Behind the bar holds various styles and regions on tap, including my personal favorites, Bell’s Amber Ale and Two Roads Lil’ Heaven. The menu is inspired by the cultural diversity of Ridgewood, juxtaposed with a fun carnival fare style. My steamy-hot and spicy vegetarian samosa came wrapped in tin foil, as if I just grabbed it from an outdoor street cart. 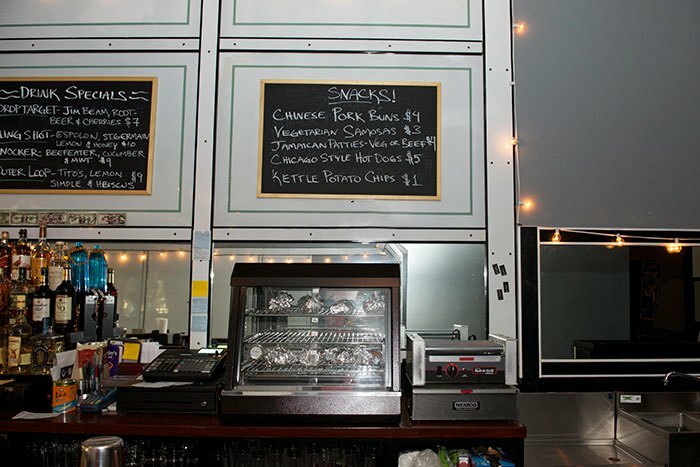 Other menu highlights include Chinese pork buns, a Chicago-style hot dog (David is originally from there, so you know it’s bangin’) and Jamaican patties – including a vegetarian alternative! The food menu is truly eclectic. Although Milo’s Bar is barely a week old, the history of the venue itself is astounding. We discovered the Seneca Avenue location has housed butcher shops since the 1930’s. The architectural detail of the bar is ‘real deal’ vintage. 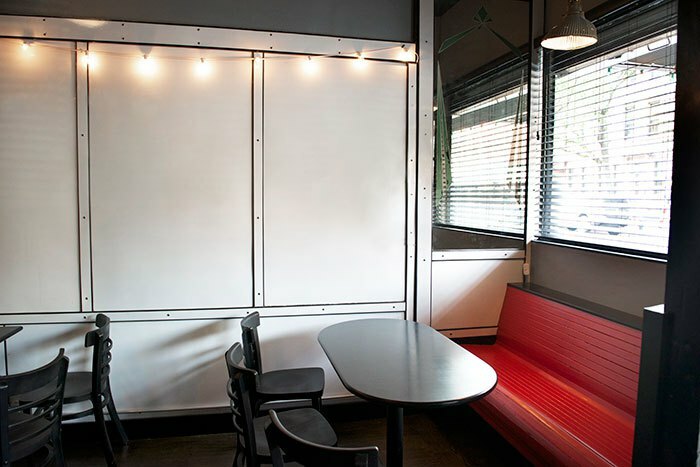 Everything from the lighting fixtures, the enamel-covered steel panels (very 50’s!) to the tin ceiling, are original components of what was once there. David and Claudia are honored to restore the dignity of the places prior and really feel proud to be part of Ridgewood’s rich history. So I’m sure you’re dying to hear about this dog, right? Milo is David and Claudia’s sweet and shy boy. He is a shelter dog, a 'big mut,' who is turning twelve this July! Milo is not about the city life. He loves his secluded backyard and it’s very much his space. 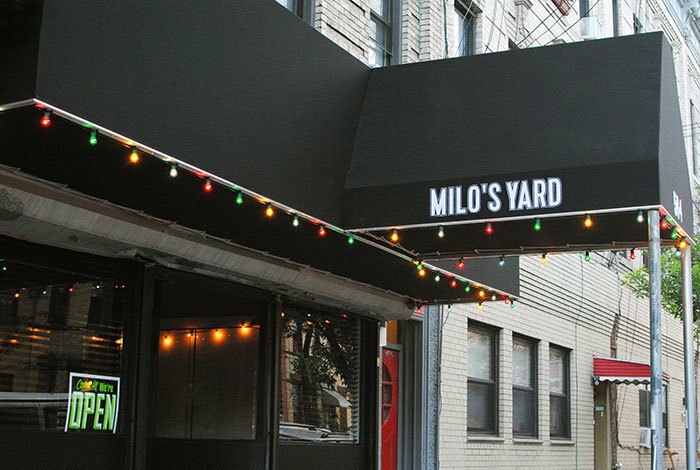 His proud owners wanted to honor that dynamic by naming the bar, Milo’s Yard. We should mention this is not a dog-friendly bar, but hey! 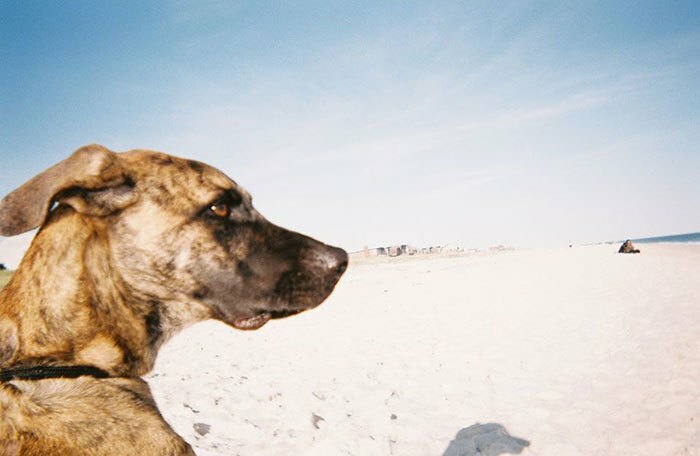 You definitely can still make a toast to Milo and your beloved canines while you’re there. Say hello to Milo, the dog, who gave the name to the bar! So sit back, relax and enjoy those vegetarian samosas. I’ll let you in on a secret – an outdoor section may be coming soon. Then you can be like Milo-- just hanging out in your favorite yard! Milo's Yard 564 Seneca Avenue, Ridgewood. Hours: Mon-Sun 4:00 p.m. - 4:00 a.m.